Explanation: Sometimes it's night on the ground but day in the air. As the Earth rotates to eclipse the Sun, sunset rises up from the ground. Therefore, at sunset on the ground, sunlight still shines on clouds above. Under usual circumstances, a pretty sunset might be visible, but unusual noctilucent clouds float so high up they can be seen well after dark. Normally too dim to be seen, they may become visible at sunset during late summer when illuminated by sunlight from below. Noctilucent clouds are the highest clouds known and thought to be part of polar mesospheric clouds. Pictured above earlier this month, a network of noctilucent clouds cast an eerie white glow after dusk, above the the city of Edmonton, in Alberta, Canada. 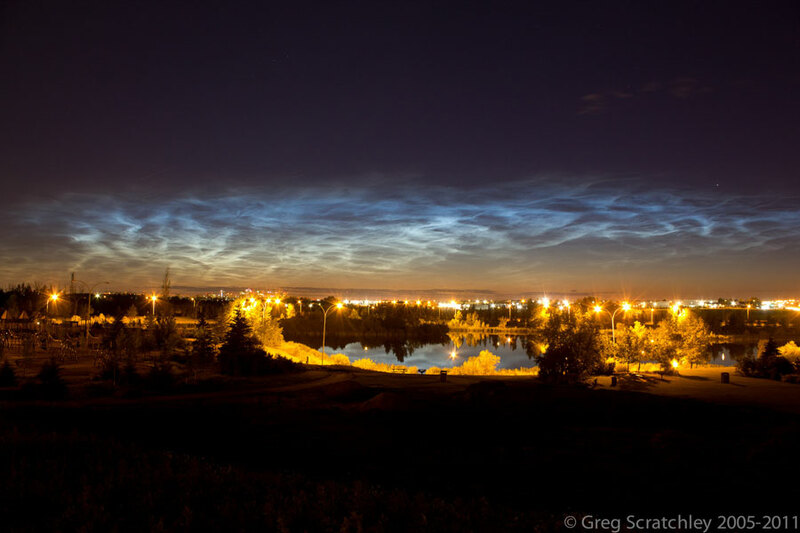 Much about noctilucent clouds has been discovered only over the past few years, while how they form and evolve remains a topic of active research.